In Unani Medicine, the name of Hakim Ibn Sina, known to the West as Avicenna, towers head and shoulders above all others. Whereas Hippocrates is called the Father of Medicine, Avicenna has been called the Father of Modern Medicine. He is also called the Prince of Physicians. Avicenna was born in 980 A.D. near Bokhara, an ancient center of culture and learning in Persia. 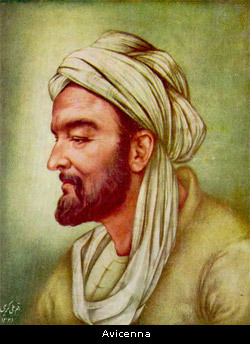 As a child, Avicenna showed a prodigious intellect. By age ten, he had committed the entire Koran to memory. While still in his teens, Avicenna had learned all there was to learn from the scholars of Bokhara, and had mastered the art of medicine. When Avicenna was only twenty-one, his father died. This traumatic event, coupled with the great political turmoil of the time, sent Avicenna on a period of constant wandering. He finally found refuge in the court of a prince in Hamdan, Persia, but even this wasn't enough to protect Avicenna from the whirlwind of political intrigue that surrounded him. He was even jailed on one occasion. But Avicenna's intellectual powers were so great that even these trials and hardships couldn't deter him from his creative work as a physician and scholar. Writing mainly from memory, Avicenna penned hundreds of works on just about every area of knowledge - physics, mathematics, economics, chemistry, natural history, religion, philosophy, music and, of course, medicine. Of these, two works are the most famous: The first is Kitab al-Shifa, or The Book of Healing. In it, Avicenna relates the principles of medicine to those of other sciences, like logic, geometry, psychology, astronomy, mathematics, music and metaphysics. According to Avicenna, any diagnosis of an illness was faulty and incomplete unless all aspects of the patient's life had been taken into consideration. A devoted student of Aristotle, Avicenna had certain bold and original ideas on philosophy and theology that were way ahead of his time. The conservative Islamic theologians of his day considered many of his religious ideas to be misguided, if not downright blasphemous. Avicenna's most famous and influential work is his monumental treatise in five volumes, al-Qanun fi al-Tibb, or The Canon of Medicine. Encyclopedia Britannica has called it the single most important book in the history of medicine, East or West. For centuries, Avicenna's Canon was a standard textbook in many European medical schools. Even today, it is the standard reference manual for practitioners of Unani Medicine. While basing his medical system on the humoral and vitalistic concepts of Hippocrates and Galen, Avicenna, in writing his Canon, took a universal perspective, collecting, distilling and synthesizing all the medical knowledge that existed at his time. Avicenna had traveled, read and studied widely on several different medical systems - Greek, Egyptian, Persian, Hindu, Tibetan and Chinese - and came to the conclusion that, beyond their superficial differences, they all dealt with the same common themes and clinical realities. They all had concepts of qualities and temperament, vital fluids or humors, vital energy or the Life Force, and similar principles of bodily structure and function, or anatomy and physiology. The sheer pervasiveness of the Canon's influence cannot be overestimated. Even some alleged folk remedies of rural Afro-Americans have been traced back to medicinal recipes from Avicenna's Canon. Subsequent generations of Unani physicians, taking inspiration from the Canon, have developed new medical techniques and treatments, and have made advances in pharmacology and drug preparation. The natural healing principles in the Canon have also been studied by Samuel Hahnemann, founder of homeopathy, and Father Sebastian Kneipp, the founder of naturopathy. Currently, only the first volume of Avicenna's Canon, dealing with basic principles, is available in English. It was translated from the Latin by the British physician, Dr. O. Cameron Gruner, and is entitled A Treatise on the Canon of Medicine of Avicenna, Incorporating a Translation of the First Book. Besides Avicenna's original text, Dr. Gruner has included a lot of his own annotation and commentary. It was published in 1970 by Augustus M. Kelley in New York City. I am deeply indebted to Hakim G. M. Chishti's excellent book, The Traditional Healer's Handbook for much of the information in this article. The Traditional Healer's Handbook by Hakim G. M. Chishti, N.D.
A lengthy, comprehensive compilation of articles on Avicenna. An excellent introduction to Avicenna and his work. A rich assortment of articles, abstracts and links on Avicenna and his philosophy. Claims to be the official Avicenna website.